What is 5-HTP? – It is the precursor to serotonin, the neurotransmitter that regulates mood, sleep and pain levels. Why would I want to take it? – Targeted Individual’s rarely sleep undisturbed by organized multiple stalking or electronic harassment protocols. What is 5-HTP good for? – It may help with other health issues affected by serotonin deficiency, including nervousness, body tension and stiffness and head cavity discomfort. Supplementing may not only assist with falling asleep faster, but also with increasing the duration of dream states (REM sleep) and of deep slumber. Where does 5-HTP come from? – When you eat meat or fish, your body takes the amino acid, L-Triptophan, and converts it to 5-HTP. 5-HTP is the precursor to the neurotransmitter serotonin. Serotonin regulates mood, sleep and pain levels. Up to a certain point, the more serotonin your body makes, the better your mood, the quicker and deeper you sleep. If my body makes 5-HTP, why buy it in a supplement? – Because Targeted Individual’s rarely sleep undisturbed by organized stalkers and electronic harassment protocols. Are 5 HTP supplements made from animals? 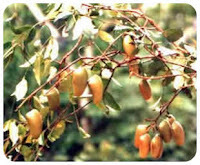 – No, 5-HTP is extracted from the seeds of the Griffonia simplicifolia plant. How much 5-HTP can I take? – Doctors agree that it is generally considered safe and beneficial for many individuals to take as much as 100 mg per day. There are some however, that say higher doses are safe as well, but these are in the minority. Can I take it forever? – There is a health warning not to take 5-HTP for more than three consecutive months without consulting a health care practitioner. Too much 5-HTP in the diet could potentially result in too much serotonin in the peripheral circulation. When shouldn't I take 5-HTP? – Here is a partial generic list of some of the conditions for which 5-HTP may be harmful. If you have one of these pre-existing conditions, professional advice may be indicated, especially if prescription medications are also being used. The principal reason for not combining 5-htp with these classes of medications is that many of them may also increase serotonin levels or affect other neurotransmitters, but by different biochemical mechanisms. The combination, in some cases, has the potential of acting synergistically to dramatically increase serotonin levels. This combined action could have adverse effects. Can alcohol and 5-HTP be taken together? – No. Allow at least six hours between use of alcohol and 5 HTP. Are there any government warnings about 5-HTP? – Yes. And this one isn’t just a scare tactic: lives were lost. In 1989, a life-threatening condition called eosinophilia-myalgia syndrome (EMS) occurred in many people using L-Triptophan and some died from the condition. All of these people had taken L-Triptophan distributed by a company in Japan. This L-Triptophan was found to contain trace levels of impure ingredients. Since that time, the FDA has limited the availability of L-Triptophan in the U.S. However, the increased use of the Internet has made many dietary supplements available from non-U.S. sources. The FDA warns: The sale and distribution of L-Triptophan outside of the U.S. does not comply with the regulations of the Food and Drug Administration (FDA) for the safe use of this medication. Nonetheless, when used intelligently 5-HTP can be a powerful weapon against situational depression caused by OS&EH. So check out 5-HTP because A Word to the Wise T.I. should be sufficient.